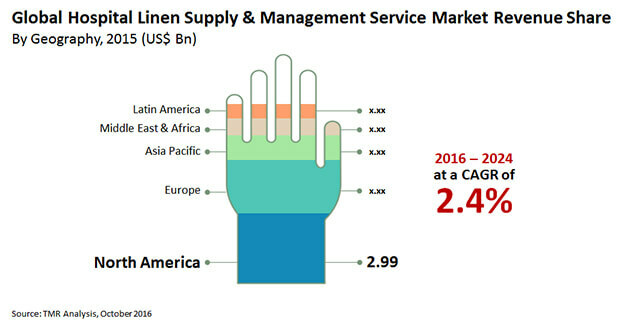 A large number of players within the hospital linen supply and management services market are fighting for top positions within the market. Thus, the environment is extremely competitive. Companies within the market are competing in terms of efficiency, quality control, and rise in the number of their services offered. The growing demand for hygiene sophistication in healthcare sector in associated business is considered to be one of the key factors fuelling the growth of the. Market players are adopting the strategy of adding value added an exclusive services to their portfolio in order to increase their customer base and attract new customers, states Transparency Market Research (TMR) in its latest research report. Some of the key players within the market are E-Town Laundry Co, Angelic Corp., Healthcare Services Group, Testudo Linen Service, and Synergy Health Plc. According to TMR, the global hospital linen supply in management services market will be worth US$ 9.1 bn toward the end of 2024. By product, bed sheets/pillow cases are stirring a higher demand as compared to any other product in the market. Bathing/cleansing accessories are expected to witness a high demand in the coming years on account of raising awareness among patients regarding hygiene and need for sanitation. In terms of the most lucrative regional market, North America is leading on account of the state of art medical facilities and advanced healthcare infrastructure. The rising number of hospitals is increasing the demand for hospital linen and this will in turn drive the growth of the global hospital linen supply management services market in North America. Asia Pacific is anticipated to be an emerging market for hospital linen supply management services on account of the rising number of healthcare institutes, hospitals, and clinics in countries such as India and China as well as the rising initiatives taken by government to ensure proper treatment and care. The growing demand for hygiene and maintenance in healthcare institutions across the globe is one of the key factors fuelling the growth of the global hospital linen supply management services market. An increasing number of people are able to spend and afford good quality Healthcare and this is increasing the demand for clean hospital linen. The growing geriatric population and stringent regulations in hospitals for lowering the risk of contamination will fuel the demand for a linen such as bedsheets, blankets, pillow cases, bed pads, positioners, and cleaning accessories. Rising number of patients in and out of healthcare facilities will also bolster the demand for hospital linen supply management services. One of the trends which can be seen within the global hospital linen supply management services market is that of outsourcing hospital linen supplies. Leading players within the market are offering services and additional features in order to attract a large number of hospitals and healthcare organizations. On the other hand, shortage of hospital in supplies which stock market is facing currently.